New York’s Rotary Clubs (District 7230) have announced the availability of at least three scholarships to local high school students to study abroad during the 2019–2020 academic year as part of the Rotary Youth Exchange Scholarship Program. Each scholarship is valued at $24,000 and includes tuition, room, board and a monthly stipend to study at the high school level abroad. Rotary volunteers make the program affordable to students, ages 15 to 18.5 at the time of departure, of all backgrounds and economic means. Living in a foreign country has a powerful accelerating effect on students’ maturing process. Students learn to appreciate and understand another culture, become fluent in another language, develop lifelong international friendships and make independent decisions. They return with a sense of self-confidence which makes them better-equipped to handle college and life in our global community. As Dilynn Kessler, of Stony Point, New York, said after returning from a year in Rome, Italy, as an Exchange Scholarship recipient, “Youth exchange is by far the best decision I’ve ever made and it changed my life for the better”. 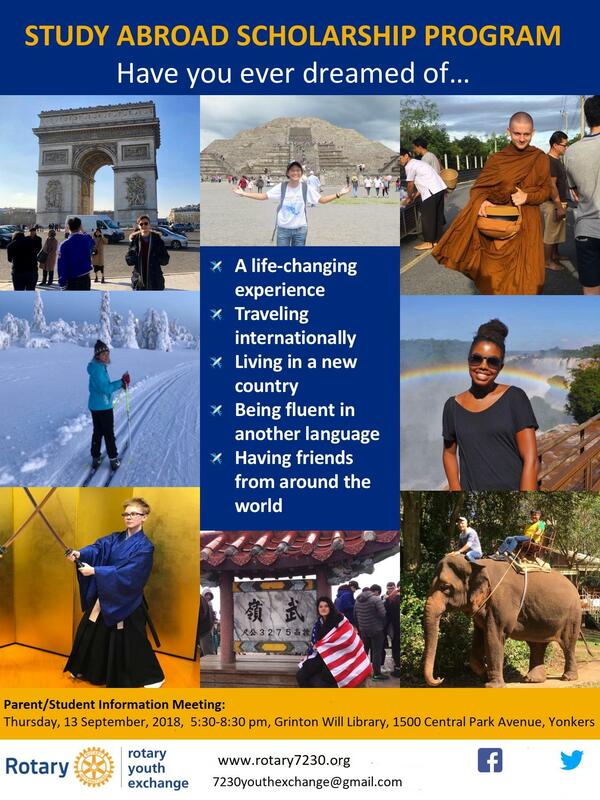 Each year, nearly 9,000 high school students around the world accept the challenge to become citizens of the world by applying to become a Rotary Youth Exchange student. Universities look favorably on the exchange experience as evidencing unusual maturity and drive in a college applicant. The experience also serves as the basis for a great application essay. Many returning students test out of entry-level college foreign language requirements with the potential to save significant amounts in tuition costs or explore additional areas of study. Rotary invests nine months in preparing each scholarship recipient for his or her academic year abroad. The student is part of the international family of Rotarians while overseas. These Rotarians are professional leaders in their communities and are directly involved in the success and welfare of the Rotary Youth Exchange Scholarship recipient they are hosting. Students attend Rotary meetings and Rotary Club members offer their counsel and support. Students are selected based on interviews, courage, adaptability, grades, school recommendations and interest in world affairs, cultures, and languages. Students are responsible for costs not covered by the Rotary Youth Exchange Scholarship. An informational session for interested students and their parents was held in Yonkers on September 13, 2018, at 5:30 p.m. at Yonkers’ Public Library, Will Branch, 1500 Central Park Ave., Yonkers, NY 10710. The next step is to complete the application process no later than Nov. 1, 2018, for departure in August of 2019.